Earlier this year a company called Lifeline Technologies based in Reno, Nevada was awarded US Patent 8,185,485. Entitled “Device for analyzing thermal data based on breast surface temperature for the detection for use in determining cancerous conditions”, the patent described a method for classifying breast tissue. 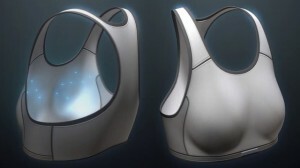 This so-called “smart bra” has apparently been under development by Lifeline for the past twenty years. How does it work? — and most importantly — Could it ever replace digital mammography? First Warning Systems, which is Lifeline’s commercialization vehicle, describes their process as “a non-invasive dynamic temperature analysis of the breast, enhanced with the bioinformatics software that integrates mathematical and medical disciplines”. The surface temperature of each breast is measured by 8 discrete sensors based on microwave antennae that are stitched into the fabric of the bra. The data from these sensors can then be continuously recorded on the miniature microcomputer system for as long as the woman wears the smart bra. Rather than a single snap shot of a conventional thermography system, as described in a previous blog, the smart bra enables changes in temperature over time to be studied. The algorithm for analyzing the temperature data is based on chronomics, the scientific study of biological rhythms, and the company argues that they are able to track angiogenic activity — new blood vessel formation — associated with tumour growth. By recording data from both healthy and cancerous tissues, they claim to have shown that “dysfunction of the circadian control genes in the peripheral tissue [are] totally responsible for breast cancer development”. Although First Warning Systems report that they have conducted three clinical trials with over 650 women to train and validate their algorithm, their refereed publications do not appear in journals likely to be read by breast imaging specialists. One also has to wonder whether a system that measures temperature at just eight discrete locations on the surface of the breast has the ability to detect deep tissue changes “years before tumour presentation”. That said, there is a certain logical appeal for an inexpensive screening device that does not use ionizing radiation or subject the woman to unnecessary discomfort. As to whether the smart bra will replace digital mammography or other diagnostic imaging modalities like ultrasound and MRI, this will simply not happen. The doctors who treat the patient — radiologists, surgeons and oncologists — will always need to know the precise 3D location of the tumour and, ideally, the type of cancer cells. Ah, yes. Thermography again. The problems remain: poor specificity (many warm benign conditions), and poor sensitivity (many poorly vascularised, cool cancers). This one is not even at the starting block.